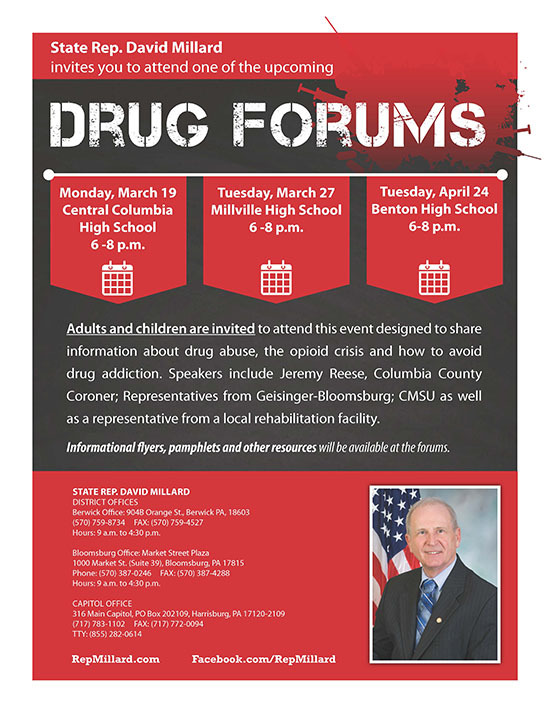 Our second spring Drug Forum will be held on Monday, March 27, at Millville High School from 6-8 p.m. Adults and children are invited to attend this event, which is designed to share information about drug abuse, the opioid crisis and how to avoid drug addiction. Speakers include Jeremy Reese, Columbia County coroner; representatives from Geisinger-Bloomsburg; CMSU, as well as a representative from a local rehabilitation facility. 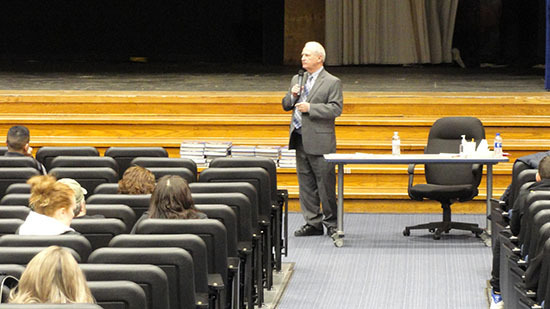 Thank you to all those who attended and participated in our first spring Drug Forum held last Monday at Central Columbia High School. Veterans who served on active duty in the Persian Gulf Theater of Operations, including Operations Desert Shield and Desert Storm, are reminded they have until Aug. 31, 2018, to apply for the Persian Gulf Conflict Veterans’ Bonus. The bonus pays $75 per month for qualifying, active-duty service members, up to a $525 maximum. For personnel whose death was related to illness or injury received in the line of duty in Operations Desert Shield or Desert Storm, an additional $5,000 is available to the surviving family. Service members who were declared prisoners of war may also be eligible for an additional $5,000. Served with the U.S. Armed Forces, a reserve component of the U.S. Armed Forces or the Pennsylvania National Guard. Served on active duty in the Persian Gulf Theater of Operations during the period from Aug. 2, 1990, to Aug. 31, 1991, and received the Southwest Asia Service Medal. Been a legal resident of Pennsylvania at the time of active duty service. Been discharged from active duty under honorable conditions, if not currently on active duty. New license plates are now available to members of the Pennsylvania National Guard to honor their service. The new plates feature the standard Pennsylvania license plate colors of blue, white and yellow, along with a National Guard-approved emblem. This plate may only be used on passenger vehicles and trucks with a registered, maximum gross weight of 14,000 pounds. Members of the National Guard interested in applying for one of these plates must complete Form MV-150AD, “Application for Members of U.S. Military Registration Plate.” The form requires the service member to certify his/her status as a member of the Pennsylvania National Guard. The addition of a registration plate recognizing members of the PA National Guard completes an assortment of plates available to Pennsylvania residents with ties to all branches of the U.S. Armed Forces. Additional information and images of a variety of military license plates are available at www.dmv.pa.gov. The fee for the plate is $21. • Congratulations to Hanna Everhart from Bloomsburg High School for taking GOLD in the 200 Freestyle (1:49:69) in the PIAA Class AA. • Congratulations to Benton High School graduate Zain Retherford, a senior at Penn State University, who won his third straight wrestling title at 149 pounds at the NCAA Division 1 championship last weekend. Volunteers are being sought for this year’s Great American Cleanup of Pennsylvania, which began March 1 and runs through May 31. A comprehensive webpage that includes all volunteer opportunities available, from the Great American Cleanup of PA and Adopt-A-Highway to Safety Training, Litter Brigades and more, is available here. The cleanup is sponsored each year by PennDOT, the Department of Environmental Protection (DEP), Keep Pennsylvania Beautiful and other partners. During last year’s cleanup, 132,695 volunteers collected over 5.3 million pounds of litter from Pennsylvania’s roads, trails and shorelines. Over 7,200 events were held, with every county participating. Groups participating in PennDOT’s Adopt-A-Highway (AAH) program, which involves volunteers cleaning roadsides year-round, are also encouraged to participate in the cleanup, with gloves, trash bags and safety vests provided. In addition, during “Pick It Up, PA Days,” set for April 7-30, registered cleanup events have access to reduced or free disposal at participating landfills, through support from DEP and the Pennsylvania Waste Industries Association. To help pass on the sport of fishing for future generations, the Pennsylvania Fish and Boat Commission (PFBC) will host two Mentored Youth Trout Days, scheduled for Saturday, March 24, in the southeast and southcentral parts of the state, and Saturday, April 7, for remaining counties. Now in its fifth year, the popular program provides adult mentors with an opportunity to take kids fishing before the traditional rush of the regional and statewide opening days of trout season. Last year, more than 30,000 participants joined in. Beginning at 8 a.m. on these two days, participants can fish in any PFBC stocked trout water. Kids can keep two trout, which must measure at least seven inches. Mentors must have a fishing license and trout stamp. Because the program is focused on kids, adult mentors are encouraged to fish with the children and provide encouragement and tips, but they must release their catch to the water unharmed. The March 24 Mentored Youth Trout Day takes place in 18 southeastern counties, including Adams, Berks, Bucks, Chester, Cumberland, Dauphin, Delaware, Franklin, Juniata, Lancaster, Lebanon, Lehigh, Montgomery, Northampton, Perry, Philadelphia, Schuylkill and York. The following weekend – March 31 – kicks off the Regional Opening Day of Trout Season in the same 18 southeastern counties. A second Mentored Youth Trout Day will be held on April 7, the Saturday before the April 14 statewide opening day of trout season. To participate, adult anglers (16 years or older) must have a valid fishing license and trout/salmon permit and be accompanied by a youth. Youth anglers must obtain a free PFBC-issued permit, or a voluntary $1 youth fishing license. Both are available at www.GoneFishingPA.com or at any of the more than 900 licensing agents across the state. Whether it’s a police stop, a tow truck picking up a disabled vehicle, or some other type of roadside emergency response, the Steer Clear Law requires motorists to ease off the gas pedal and move over to give emergency responders room to safely work. (2) If passing in a nonadjacent lane is impossible, illegal or unsafe, pass the emergency response area at a careful and prudent reduced speed reasonable for safely passing the emergency response area. The penalty for violation is a flat fine of no more than $250 for the first offense, and the fine doubles for a second offense. Fines are quadrupled to $1,000 for a third or subsequent offense. Additionally, a motorist’s driving privileges would be suspended if the violation results in serious bodily injury to or death of another person or if it is a driver’s third or subsequent offense. Please remember when you are traveling to move over or “steer clear” of emergency vehicles on the side of the road.